Richard has taught myself, my brother and his friend to drive after finding him online, passing him along after each success story. I have used 3 different companies, including AA and it was under Richard´s tutelage that I learnt the best. His approach of patience, persistence, enthusiasm and subtle nagging (always a good thing when learning to drive) combines to create a fun yet very productive learning environment whereby I picked up the rules of the road very quickly. His clear and coherent way of explaining things meant I didn´t progress without understanding completely what was required around every corner and quickly I built up a comprehensive knowledge of the road. 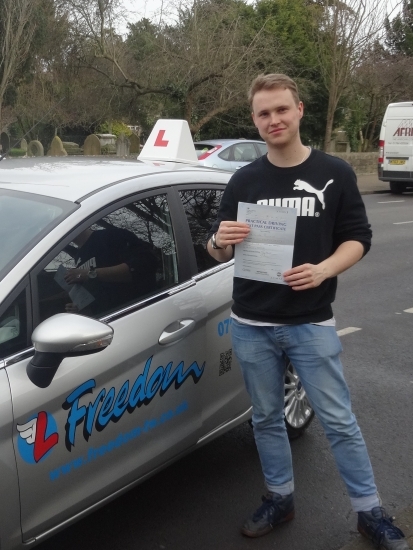 Richard strives to make every student become the best driver they can be through expert knowledge and an injection of fun. I´m so happy to have now passed my practical and will definitely keep in contact with him as I will miss the football chats and the rude jokes! Richard you’re a legend!